The problem are cause to a wrong conversion of the iso program file created by Aspan in the Xilog/XilogPlus format. To do this conversion, Aspan uses an utility created by SCM: WinXiso.exe. Usually Aspan has a copy of the winxiso file (and all the related dlls) in its installation folder, but as you can understand, considering all the versions of the Xilog interface, sometimes happens that this version cannot work with the Xilog used on the machine. 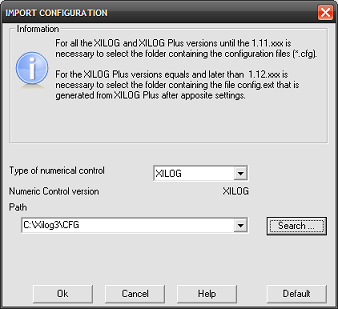 all needed files to import the configuration in PARTNER/ASPAN are located into the folder CFG located into Xilog installation directory (example: C:\Xilog3\Cfg or C:\Program Files\Scm Group\Xilog Plus\Cfg). If PARTNER/ASPAN is not installed directly into Machine PC or the folder is not accessible via LAN make a copy of the entire folder Cfg and save it into a temporary directory in the PC where PARTNER/ASPAN is installed to proceed with the import. Open PARTNER/ASPAN and from the supervisor environment execute the menu command "Machine > Configuration > import". In some PC it may happen that after an update of ASPAN, when loading, giving error messages: FATAL ERROR, incorrect version of a library (*******. Dll). Microsoft Windows Vista is no longer compatible with the help system used by Aspan. The BarCode Reader is supported starting from ASPAN 6.0. The only supported BarCode type is "3 of 9". You can configure the BarCode either from inside the Supervisor (utility => BarCode configuration), the CAD (File => Preferences "BarCode configuration") or at the moment the Part Program is created (the "BarCode configuration" button). n order to connect a digitizer to our programs the digitizer must communicate (with the computer) using ASCII format. We have tested two different brands of digitizer, but every digitizer that satisfy the above statement may also be used with our programs. We suspect the problem may be caused by the driver of the graphic card. control-panel, system, performance, graphics, none. There is a possibility that the drivers used by your graphics cardare wrong or not correct. In the Windows 95 toolbar, click the 'Start' button. From the Start menu, click 'Settings' -> 'Control Panel'. In the Control panel folder double click (open) the 'System' icon. How to solve: PP009-11 Checking Protection Error. Open "My Computer", select View => Options => File Types. Find the program association and Edit it removing the undesired extension from "Default Extension for content type"
The drivers of the hardware key can be downloaded from the official website of the Sentinel. Must be manually installed the latest version of the driver. Read its FAQ. Note: If you do not have the 'Run as administrator' option, please contact your company's IT Administrator to give you access to this or have them perform the procedure for you. • Once 'cmd.exe' shows in the program list, right-click it and select: Run as Administrator..
nstall Aspan on to a PC with Windows 95 or 98 operating system. Run Aspan at least once. Make a backup of the "C:\Aspan4" directory, including all the subdirectories, from the Win 95/98 PC to the Win NT PC. You may use the network if available or a parallel or serial cable or you may use diskettes. Restore the previous backup of the "C:\Aspan4" directory, including all the subdirectories, on to the NT PC. Install again Aspan on to the NT PC, overwriting the restore. If using TASK 3.04p1+ (or ASPAN 4.05p3+), if having a recent HardLock Key (shipped after 6/97), if installing under Windows 95: NO problems. If using TASK 3.5 (or ASPAN 4.6), if having a recent HardLock Key (shipped after 6/97), if installing under Windows 3.1, Windows 95 or Windows NT: NO problems. If you run ASPAN and you get a message such as: 'You need a primary HardLock key in order to run Aspan for the first time', this means you are trying to run ASPAN with a secondary (additional) hardlock key before having activated it. The secondary hardlock has a (A) printed in its label following the serial number. Before plugging or unplugging a hardlock key switch off the computer, to avoid damage to the key. The Demo CD contains a presentation, realized with Power-Point, that illustrates the functionalities, the environments of the program, and olso the additional modules of ASPAN. It includes also some videos, depliants, and documents that illustrates ASPAN and its functionalities. The Demo is available in two formats: ZIP archive or ISO disc image, and can be retrieved into the Downloads section of this website. would like to print the drawing without any text above it. Is there any way to delete the header so that it will not be printed out? There is no way to only print the drawing from Aspan without the header placed automatically at the beginning of the page. You may find useful, if you use AutoCAD, to activate the Aspan-AutoCAD link and then print from AutoCAD. When entering the CAM the message stack overflow appears and the program exits to the operating system. The NC Release has not been set properly. Set the proper NC Release in ASPAN and then import the machine configuration from the parameters diskette created in the NC. Set the ObjPerBar parameter greater than 0 and different from 10, typical 20. WB3 activates both the left and right group at the same timeSB10 nulls SB11 and SB12 (do not make holes). Inserting SB10 as the first step in a program, you are sure that the horizontal groups are immediately "armed", and lowered ready for boring. H DX=2566.00 DY=291.00 DZ=25.00 -A C=1 R=1 *MM /"DEF"
The program assigns automatically a value of "1" in the "C=" field (machine continuous execution). 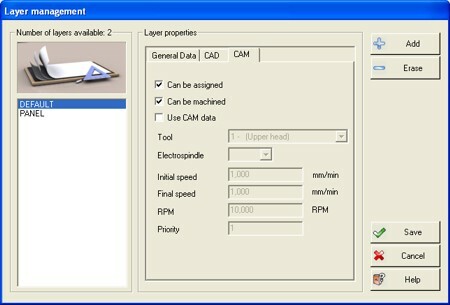 To modify this parameter, in CAM, when creating the part-program, disable the "continuous execution" option. 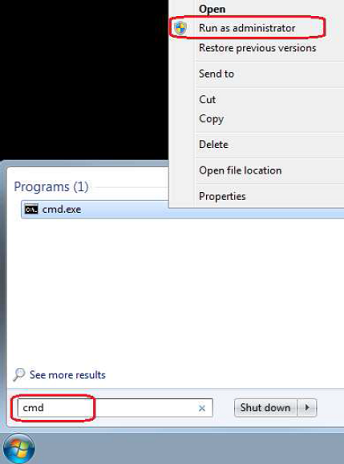 Press Header and disable the "continuous execution" option. press the button numerical control and enable the option "convert in binary". This operation will affect part-programs format when created by the CAM environment or by ASCASP/ASCTASK external programs. if the "convert in binary" option is disabled a XXL (ASCII) part-program will be created. WARNING Some entities lay on layer not enabled to the generation of the part-program. This message is warning you that there are some entities on a layer in which the CAM processing is disabled. It can be an intentional setting or a lapse, so the message is just a memo. You can control your layers settings through the menu command Layers > Edit. 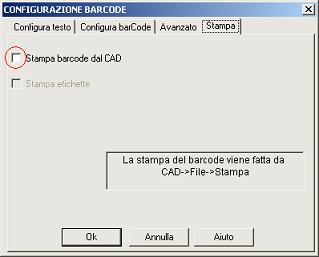 Uncheck the option "Print BarCode from CAD". To correctly visualize the new 3D simulation introduced with the release 9.1 of ASPAN it is necessary the Java Virtual Machine (JRE). The machine configuration, in ASPAN, does not correspond to the real physical machine configuration. This error can happen if you have or had an Aspan version 4.63p2 and you try to change the Numerical Control version. 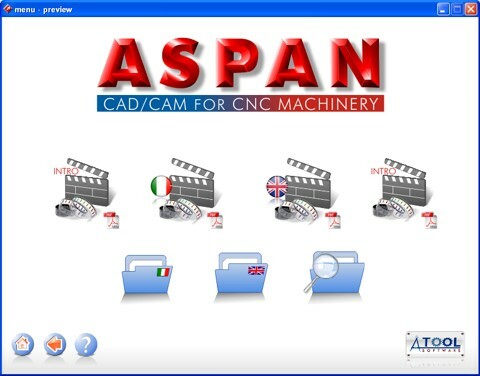 Aspan or ASCASP support Morbidelli machines but only with TRIA, XILOG or KVARA numerical control. WS02 control is not supported. How can I import drawings and data to the program coming from ... ? 1) drawings via DXF files limited to 2D entities. 2) drawings via ASCII files in ATool Software proprietary format with ASCASP.EXE external procedure. 3) part-program in ESA (TRIA) or Xilog format. How can I export drawings and data from ther program to ... ? ASPAN can generate DXF and NC files. DXF import of Ellipses is inaccurate. When importing Ellipses from a DXF file, Aspan creates 16 arcs. You can save the DXF file as an "AutoCAD 12 DXF file": this will create a lot of small arcs. change the value from 16 to the one you need (i.e. 100). Note: After having imported the Ellipse, you may find useful the CAD command: path -> Routing reduction in order to reduce the number of arcs, while maintaining an acceptable accuracy. the DXF should be generated in a format compatible with AutoCAD 12, 13 or 14. Most CAD make these DXFs. the DXF could contain the following entities: lines, arcs, 2D polylines, ellipses, 2D splines (NOTE 2). You may export text using a trick: see NOTE 1. If you have a DXF file created by AutoCAD or any other program, ASPAN will be able to import it (see Generic 2D DXF import). If you want to work with DXF files in a closer way, you may want to use the "2D Exploded DXF". This feature is only available starting from ASPAN 4.6. (see 2D Exploded DXF import/export). 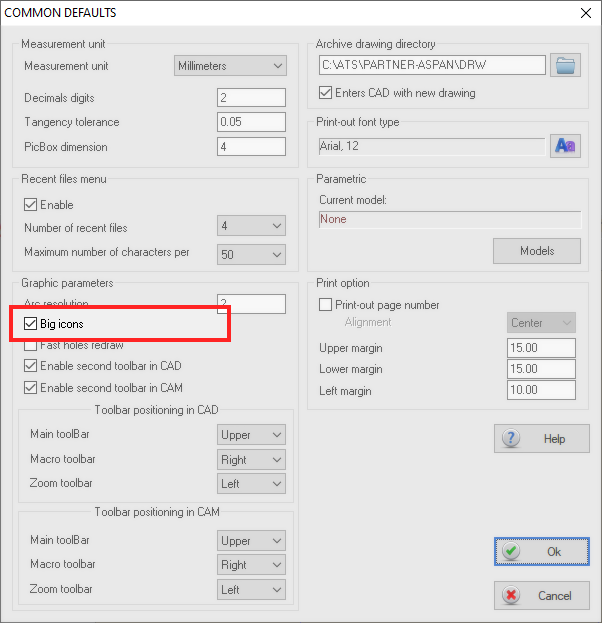 If you want to directly draw from inside AutoCAD, see Linked AutoCAD. 10) Run ASPAN and re-link AutoCADFrom now on, when you Run AutoCAD using the just modified Shortcut,you will get all your toolbars;when you run AutoCAD from inside ASPAN you will get the PAD menu. AutoCAD bas been linked to ASPAN (the link procedure from the "CAD option" menu has been used and AutoCAD is called from inside ASPAN with the CAD-> AutoCAD command). In the AutoCAD environment the graphic entities, holes and routings, have been drawn, but when returning back to ASPAN any or all entities result to be lost. There are two different ways to send part-programs directlyto the NC from ASPAN/TASK.